Sometimes when people come back from a vacation, or simply from someone else’s house, they can wake up the next day with itchy and irritating bites all over them. These are likely from bed bugs. Bed bugs can be notoriously difficult to deal with. That’s why you need a pest control company that can handle the trickiness that comes along with a bed bug infestation. Twin Forks Pest Control is that company if you have a bed bug infestation in the Hamptons. We have years of experience in dealing with pests of all kinds and bed bugs are no different. If you found that you have a bed bug infestation, don’t hesitate to call Twin Forks Pest Control. Bed bugs are parasitic insects that feed exclusively on the blood of warm blooded animals. Unfortunately, humans do fall into the category of hosts for bed bugs, and in fact, they are the preferred host. Their Latin name is Cimex lectularius. Bed bugs are very small reddish-brown insects. They are about 1/4 of an inch long when fully grown. Being insects, they will have six legs and short antennae. They do not have wings and therefore don’t fly. They aren’t very fast, moving at around the same speed as a carpenter ant. Unlike ticks and mosquitoes, bed bugs very rarely transmit diseases when they bite. Bites can however irritate and itch much like a mosquito bite. Bed bug bites can appear in a variety of different ways depending on the person that was bitten. 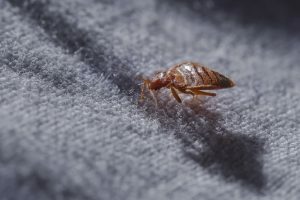 For some people, bed bug bites won’t appear at all, for some they will be similar to mosquito bites, small red bumps with some irritation, and for others, they may appear as welts that take weeks to go away. In any case, much like mosquitoes, it’s hard to tell when you’re being bitten, especially considering bed bugs typically target sleeping hosts. Bed Bugs are excellent at hiding and are usually spread by staying at an infested house, hotel or hostel and having them hide in your luggage, buying used furniture or mattresses. The history of the bed bug is actually rather interesting, and for a long time, they were nearly a non-factor. When the pesticide DDT came along, bed bugs were nearly wiped out in developed countries such as the United States, the invention of the washing machine, and vacuum cleaner also helped cut their populations. Once DDT was found to be harmful to the environment, however, their populations started making a comeback. Getting rid of bed bugs completely can be an extremely difficult procedure. That’s why you need to leave it in the hands of a professional. If you have a bed bug infestation in the Hamptons or anywhere on the east end of Long Island, don’t hesitate to call Twin Forks Pest Control.